The 3C Series AC & DC loads comprises a range of medium to high power AC and DC capable load systems with support for up to 350V AC and 500V DC input voltages. 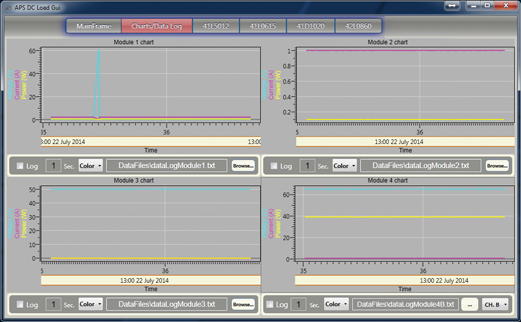 All 3C Series model loads share a common, modern user interface. Packaged in a compact 19” 4U chassis, 3C Series loads support up to 3750 VA/W per chassis. For higher power requirements, 3C Series load can be paralleled using their standard Master/Slave mode. to support power levels up to 22.5kVA/kW or 67.5kVA/kW for three phase applications. Master/Slave configurations are controlled from the master front panel or remote control interface. Rack mountable versions of the 3C with one master and two or three slaves are available as well for these power level requirements. For questions regarding the 3C Series AC Loads, please contact us. The Adaptive Power 3C Series loads are intended for medium to high power AC or DC test and product development applications in a wide range of industries. The 3C Series models support voltages to 350Vrms in AC mode and 500Vdc in DC mode. They are ideally suited for testing AC Sources and DC/AC inverters. Their flexible V-I operating curves span range of voltage and current combinations at any given power level. All 3C Series models have a low range mode for enhanced accuracy and resolution at lower voltage and current levels, further increasing their effectiveness. This series includes application specific test modes for UPS testing, Battery Testing and PV Inverter testing to speed up production throughput. The 3C Series consists of five different rack mount models up to 3750VA/W per 19″ chassis and can be paralleled up to 22.5kVA/kW per phase for higher power requirements. Cabinet models are available as well in power ratings of 7500VA/W to 22,500VA/W. All APS 3C Series Loads are equipped with a large high brightness Fluorescent display and functional keyboard. This makes these load very user-friendly. Built in modes and capabilities cover a wide range of special load applications. Enhanced precision metering of Voltage, Current, Power and Resistance compared to prior generation load models is standard. Elaborate testing of linear and switch mode AC Sources, DC/AC inverters or Frequency changers is made possible by flexible ranging and wide V-I operating curves found in all 3C Series APS loads. This supports extensive production test and burn-in of AC power supplies, UPS’s, PV inverters as well as fuse and breaker testing. 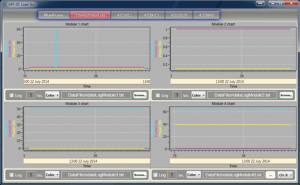 Standard test modes for these types of tests are built-in the 3C load firmware so less programming and user involvement is required compared to traditional loads. With built-in features like over current protection (OPC) test and over power protection (OPP) test and Power and Crest Factor control and non-sinusoidal waveform testing, new AC power source designs can be thoroughly evaluated against design specifications. 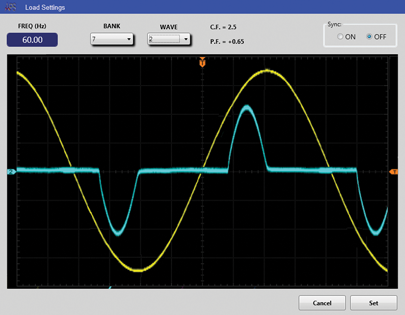 An analog input mode allows arbitrary current waveforms to be applied to a unit under test. 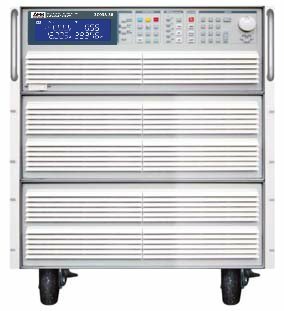 The 3C Series load to double duty as fully capable DC loads as well so you are not stuck with wrong type load when it comes to testing AC/DC power supplies or DC/DC converter testing. Using the DC load mode, specific discharge current levels can be set as a function of battery voltage. This allows characterization and performance testing of various battery chemistries. 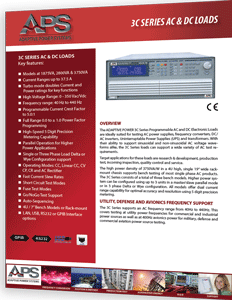 Several AC/DC supplies and converters can be tested in DC mode as well. 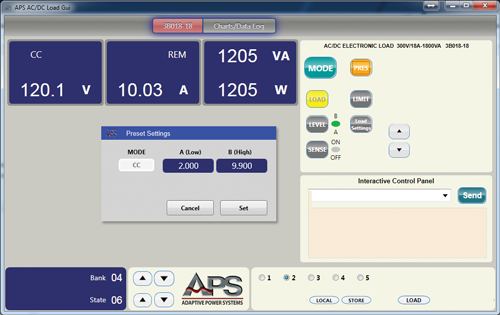 Special battery discharge protocols are built-in the load including SoC monitoring and timed discharges. All 3C Series loads are supported by the APS AC&DC Load Control windows software.